Calling all wives! We are only six days away from this life changing event. We have heard your request and we have responded! Can’t make the full conference, that’s okay, It’s not too late to register! *Registration closes June 24, 2018. 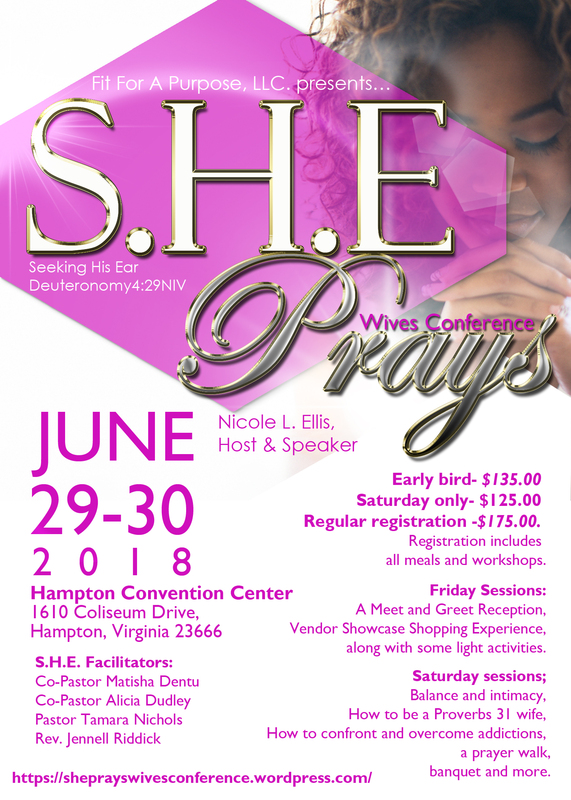 Also, join us Friday, June 29, 2018 for a wives Shop & Mingle from 6:30 p.m.-9:00 p.m. This is FREE and open to Wives only. This year has gotten off to a busy start; however, I am still here. I’m on a mission to inspire, motivate and encourage others to become FIT FOR A PURPOSE! I believe we are all called for a purpose and on this podcast I’ll share tips on how you can become purposefully fit; spiritually, mentally, physically and emotionally. Like us on Facebook @Fit For A Purpose, LLC. Good morning, the journey continues. Here is the 5-day recap. Day 26: No Matter How Small– Read Job 27:4 (NAS). A lie is a lie no matter how big or small you think it is. If you are distorting the truth then it’s a lie. Psalm 51:6 says, “You desire truth in the inward parts, and in the hidden parts You make me to know wisdom.” The Lord desires us to walk in truth outwardly with others and inwardly in our hearts. Day 28: In What Do You Boast – Read Psalm 20:7 (NAS). What do you boast in? Should you even boast? Psalm 75:5 (NAS) says, “Do not lift up your horn on high, do not speak with insolent pride.” Basically, don’t toot your own horn. Allow others to sing your praises. When you do boast, boast in the name of the Lord. Day 29: What Do Your Lips Preserve? – Read Proverbs 5:2. God wants our lips to keep knowledge and speak His words. Are you releasing words that will harm others or words that are pleasing to God’s ear? Always consult God and ask Him to help you speak His words and not the words of the world. Day 30: Would You Pass the Exam? – Read Psalm 17:3. If the Lord visited you and inspected your character, would you pass the exam? The author says, “Your reputation is what others think you are; your character is what you really are.” Take serious inventory over your life and ask yourself would you pass the exam? Day 22: Use Words that Free – Read Proverbs 6:2-3. If you are not careful and prayerful with your words, you will become trapped by them. When you speak, be sure to release words that heal and set others free. Day 23: The Taming Work – Read James 3:8-10. It’s amazing how a person can proclaim the love of God and the next moment judge, criticize, gossip and more. Take time to cry out to the Lord to tame your tongue. The Lord is the ONE who gives us power over this tiny member of the body. Day 24: Crying In Your Distress – Read Psalm 3:4. Everyone has experienced moments of turmoil, trauma and disappointment. These moments don’t often yield warm and fuzzy feelings or words. Instead of running to complain cry out to the Lord. He can turn your mourning into dancing. He is the ONE who can give you PRAISE on your lips even while in moments of distress. Give your tough times to Him. Day 25: Do Your Words Build? – Read 2 Samuel 23:2. Take inventory over your words. Do you speak words that build people up? Be honest. When was the last time you encouraged someone? There is something special about using words of beauty. Speak words that build people up each and every day. Happy Wednesday. I apologize for the delay. I was traveling and entered a busy season; however, I wanted to provide you with the remaining days of the word fast. The busy season is over. Day 16: Speech 101 – Read Proverbs 10:19 (NIV). Sometimes it’s best to remain silent. A common misconception is that you have to respond to everything or that you have to respond with a lot of words. The more you talk, the greater the risk of offense. Speak less and pray for times to remain silent. Day 17: Keep It Covered – Read James 4:11. Do not slander one another. When you speak against someone in judgment, condemn them, curse them, gossip about them, etc. you are operating like the world. As Christians, we should encourage, pray for one other, correct in private with love and keep the confidence of others. If you see someone sinning or know of an indiscretion it’s not for you to blab it to others. Keep your mouth covered and don’t judge or gossip. Go to God for guidance. Pray don’t run your mouth. Day 19: Post a Watch – Read Proverbs 13:3 (NIV). Posting a watch also means to set a guard over your mouth. People who enjoy speaking their mind with no consideration for other people’s feelings are destructive. When you take time to keep watch over the words that you say, fewer people are hurt and God will be pleased. Just because you have an opinion doesn’t mean you have to always share it. Day 20: Find the Secret Place– Read Hebrews 11:3. The Word of God controls the spirit world and the natural world is controlled by the spoken word. In order to speak the words of God, we have to spend time with Him in the Secret place. When we find the secret place of abiding in Christ, we SUBMIT our souls and spirits to Him. When we are led by the Spirit our words won’t wound, but heal. Sorry for the delay. We are still walking this 40-day journey out. Here is the 5-day recap. Day 11: An Encounter with the Holy– Read Isaiah 6:5-7. When we have an encounter with God we should see ourselves for our sinfulness in comparison to His righteousness. We should understand that our words when not led by the Holy Spirit will continue to defile us, but through Christ and only Christ can we be saved in spirit and in word. Let the Lord cleanse the negativity out of your heart. Day 12: Wise or Foolish? – Read Proverbs 14:3. The words of a fool brings harm to others and himself, is full of pride, spoken rashly and causes him punishment. Whereas the words of the wise bring life to others and protects himself, is humble, spoken with care and brings him honor. Wisdom is the key to life and peace. Are your words wise or foolish? Day 13: What Comes First – Read Psalm 5:1-3. What do you do when you begin your day? Get in the habit of being fruitful by staring your day crying out to the Lord in praise and prayer. By directing your first words to Christ, He can guide the rest of your words during the day – IF YOU SEEK HIM. Day 15: Set a Guard– Read Proverbs 21:23. Guarding your mouth means taking time to speak the truth, being free from fights, protecting what goes in and what comes out. The word fast means “to cover the mouth”. Use wisdom and cover your mouth to determine what you should release. It’s not to late to catch the replay online and to join me at 5:00a.m. EST. Good morning family and friends. Guess who will be in the 2018 Dancing In My Father’s House Calendar? If you guessed ME, then you are correct. My picture was entered for review and I was selected. I’m so honored and humbled as God has truly blessed me with a gift to minister to people through dance. This picture symbolizes me holding on the promises of God and releasing them to others. We serve an AMAZING GOD. Kimberly Smith is the owner of the calendar and she is a mighty woman of God. Do me a favor and pre-order your amazing 2018 Calendar! You better hurry there will be only a limited amount of copies available.